Article by MCO projects in Dublin on the studio for the Dublin Chamber of Commerce reception project. Many thanks to Aisling O’Sullivan and Aileen Igoe for your help with the project. In the fifth of our Designer Profiles, we’re featuring designer and furniture-maker Leo Scarff who is creating bespoke lighting and coat rack piece for the Dublin Chamber of Commerce reception area. 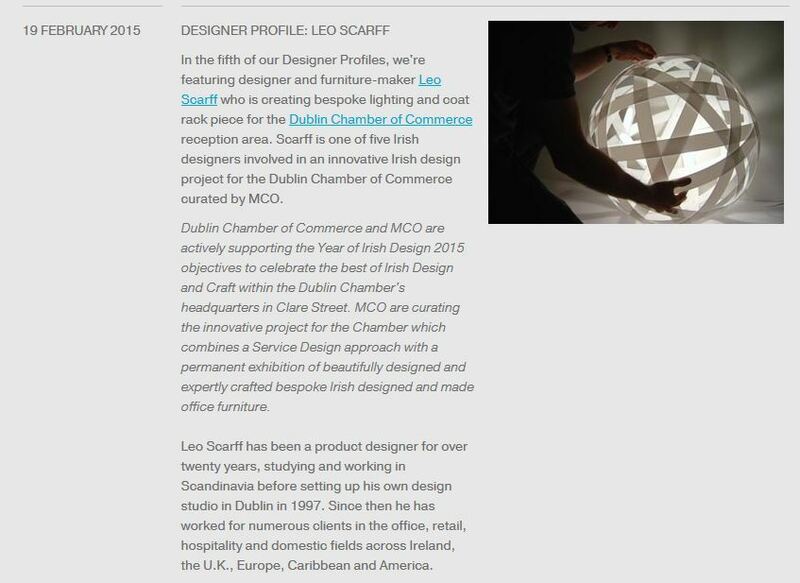 Scarff is one of five Irish designers involved in an innovative Irish design project for the Dublin Chamber of Commerce curated by MCO. Dublin Chamber of Commerce and MCO are actively supporting the Year of Irish Design 2015 objectives to celebrate the best of Irish Design and Craft within the Dublin Chamber’s headquarters in Clare Street. MCO are curating the innovative project for the Chamber which combines a Service Design approach with a permanent exhibition of beautifully designed and expertly crafted bespoke Irish designed and made office furniture. Leo Scarff has been a product designer for over twenty years, studying and working in Scandinavia before setting up his own design studio in Dublin in 1997. Since then he has worked for numerous clients in the office, retail, hospitality and domestic fields across Ireland, the U.K., Europe, Caribbean and America. The studio’s primary focus is on lighting and furniture design however our interests extend to sculptural structures of various kinds, very often for large spaces where a dramatic focal point is required. They also launched a new collection of commercial furniture called Hiberform in 2011.